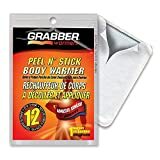 Grabber Warmers are single use air-activated heat packs that provide everyday warmth and are ideal for keeping your body warm when the temperature gets cold. 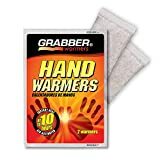 Grabber Warmers are a non-toxic, odorless heat source using all-natural ingredients that are non-combustible. Quantity: 8 Pair Hand Warmers, 8 Toe Warmers, 8 Adhesive Body Warmers. Ingredients: Iron Powder, Water, Salt, Activated Charcoal, and Wood Fiber. Buy with Confidence - To ensure you receive genuine Grabber products when shopping online, please only purchase from authorized distributors or retailers or an Amazon listing that clearly states the product is sold and shipped directly by Amazon.com. Unauthorized sellers, such as private sellers (not commercial sellers) may offer outdated products or imitations not meeting Grabber quality standards. We want our customers to purchase our products with the confidence that they are getting genuine, quality Grabber products. TO ACTIVATE - Remove warmer from outer package. Warmer heats up in 15-30 minutes. If heat decreases, expose warmer to air and shake. After use, dispose with regular garbage. Ingredients will not harm the environment. QUAILTY - To ensure you receive genuine Grabber products when shopping online, please only purchase from authorized distributors or retailers or an Amazon listing that clearly states the product is sold and shipped directly by Amazon. com. 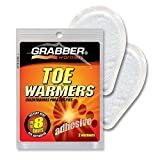 Interested in the Grabber Warmers Grabber Excursion Multi-Pack Warmer Box, 8 Pair Hand, 8 Pair Toe, 8 Peel N' Stick Body Warmers, 24-Count? Is the price too high? You can easily price watch this product and we'll notify you when the price reaches your target.